It has been a bright, mild and cheery weekend in my part of the world, and promises to be an even better week. So I am sparkly and happy, ’cause spring is really here. 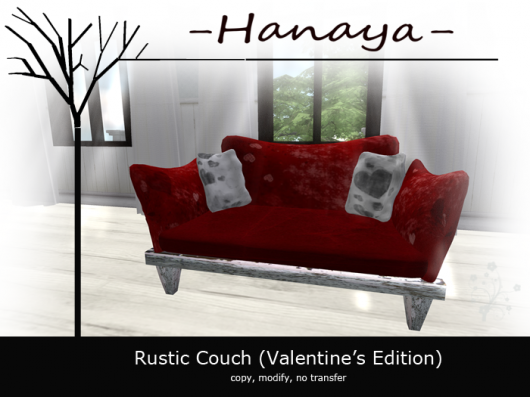 First, I am excited to announce that -Hanaya- is participating in the Couch Potato Hunt, which starts tomorrow (March 1st) and ends on March 29th. With the Couch Potato Hunt, I guess I have couches on the brain. The Organic Breezes Living Room and Dining Room sets are out at the store now, and will be on the Marketplace for gift giving in a day or two. I have a lot of stuff in progress, some of which you can see in the store or at the greenhouse – the stuff with big “COMING SOON” signs on it. And yes, for those of you waiting for the Garden Water Faucet and Hose set – it will be out in about a week. I just need to finish the sculpt maps for various sections of hose, so you guys will be able to set it up in a realistic manner that works for your home or business. That’s it for now, have a wonderful and fun week! This entry was posted in Freebies and Gifts, News, Product Announcements on February 28, 2011 by moriko. First, let me thank you all for attending the one day hunt – it was great to meet and chat to many of you. And congratulations to Quinn Gearz who won the 1,000 Linden Gift Certificate (name disclosed here with permission). I was so busy with setting up the Spring Store Reopening and hunt last week, that I did not even have time to let you guys know about new releases. If you are like me, you are itching for spring. So bring some fresh, crisp and clean colours into your home with the Spring Flowers Dining and Living Room sets. The -Hanaya- Spring Flowers Living Room Set is priced at 50% off for the remainder of February at our inworld store location ONLY. This set is full of goodies, be it the three sit poses and our 3-position posing stand built into the flowery scrunchy rug, the yummy tulip lamp, or everyone’s fave tulips in a glass apothecary jar. The matching dining room set, with Bits and Bob’s eating animations for boys and girls is a perfect match. Come and try it out and have a great weekend! This entry was posted in Product Announcements on February 25, 2011 by moriko. I know that tulips generally poke their tender leaves out of the ground later than other spring bulbs, but I could not resist forcing these yummies indoors, popping them into glass containers so that you guys could get an early start on decorating your home or business for spring. Available both inworld as well as our web store. This entry was posted in Product Announcements on February 21, 2011 by moriko. 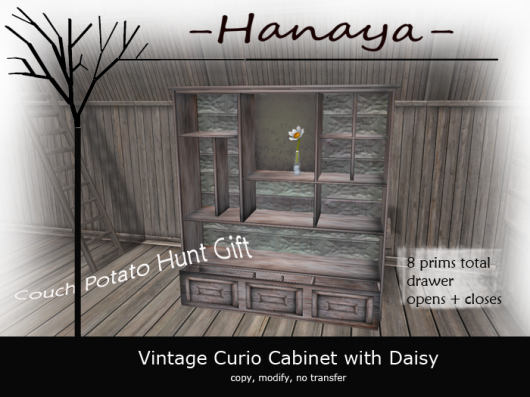 The -Hanaya- Spring Store Re-opening and Hunt is a 24-hour event on Sunday, February 20th, 2011. It starts at 00:01 AM SLT. That is California time for those of us that are time-zone challenged. A gift is waiting for you at the arrival point, and by clicking the Hunt poster outside, you can enter your name to enter the raffle to win a 1,000 Linden Gift Certificate redeemable for merchandise from our store (see below for details on how the winner is chosen). There are 7 tulips hidden at the store – 5 inside the store building, and 2 outside. Do flowers grow in trees? Have you climbed down the the rope? Is this crane a vegetarian or what? Take a walk up the rear stair case. This tulip has a long shelf life. Instead of hiding one single item with the Gift Certificate, we decided it would be more fair if everyone that attends the hunt would have a chance to win it. On the day following the hunt, all names will be put into a spreadsheet, duplicate names will be consolidated, the names will be numbered according to alphabetical order, and then a scripted tool will be used to generate the winning number. The winner will be advised via IM and notecard on Monday, February 21st, and their name will be published (with their permission), on our blog. The draw will be done on Monday, Feb 21st at 5 PM SLT. Please note that we do not use (nor have we ever used) any tools at our store that may compromise the privacy of your information. This entry was posted in Events on February 19, 2011 by moriko. The bulbs are peeking up in my real life garden, and European birds are singing and marking territory in preparation for spring, which is just around the corner. In my Second Life, I have been busy getting the -Hanaya- store and our mainland parkland for spring too. As you guys may know, I am a nature girl who is into trees, perennial gardening, woodland plants, and birds. So it is not a suprise, that I had fun creating original sculpt maps for a yummy bird house. At only 6 prims, but looking like it is made out of 50, I hope you guys will love it as much as I do. 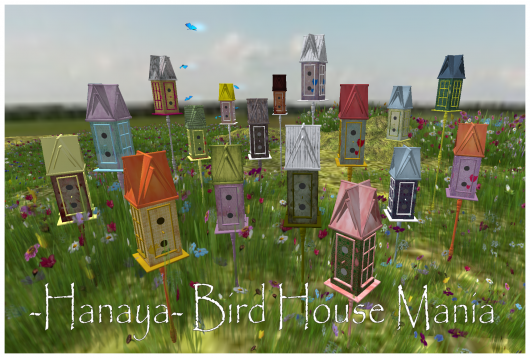 These yummy bird houses are available in a Bird House Mania Superpack, in several smaller bundles, as well as individually. The Bird House Mania Superpack will be priced super low during our official spring store opening on Sunday, February 20th. So come and visit us, and enjoy the spring! This entry was posted in Product Announcements on February 19, 2011 by moriko. Yay! The spring cleaning is finished and the new store is ready to open this Sunday. To mark the occasion, we are having a 24 hour store-wide hunt on Sunday, February 20th. The hunt and the new store open at 00:01 AM SLT on the 20th. Seven lucky tulips will be hidden in the store – come and collect them all! One lucky hunter will find a 1,000 Linden Gift Certificate to our store. This entry was posted in News on February 17, 2011 by moriko. Wrap your gift in our Happy Gift Boxes for Giving – these adorable embellished treasures are mod/transfer, so you can stuff your prezzie inside and pass it to your special person. Also, the FREE Valentine’s edition of our Rustic Couch and Rustic Coffee Table are still available on the store group and subscribo. Work is almost completed on our new enlarged store, all dressed for spring YAY! The opening is planned for next weekend, with a store-wide mini hunt with lots of yummy freebies. Can’t wait! This entry was posted in Product Announcements on February 12, 2011 by moriko. I am so excited … *hops up and down* …. I have been rebuilding the shop building for the last week, getting it ready for spring. Same look and feel, but a bit bigger inside and out, to give us more room for new spring releases .. YAY! Must plan party with prezzies to celebrate! More on the Spring Store Opening in the coming weeks. The group gift is set out inworld, or get it from group notices. The subscribo gift will be in the subscribo history for a while, so if you missed it, pop by the store, and click on ‘Join’, then on ‘History’ to get it. This yummy little couch is upholstered in red plush fabric with shabby hearts, is mod/copy and includes two animations. All this in only 9 prims, with a custom couch base sculpt map created especially for this piece. To hide or show the poseballs, use the /1 show/hide chat command. A matching rustic table topped with a big cushion to put your feet up on, and a sculpted red red rose. We will be participating in the Atooly Theme Market starting February 5th. The theme is ‘Movies of the 80s’. More on that in a few days, along with a pic and landmark. 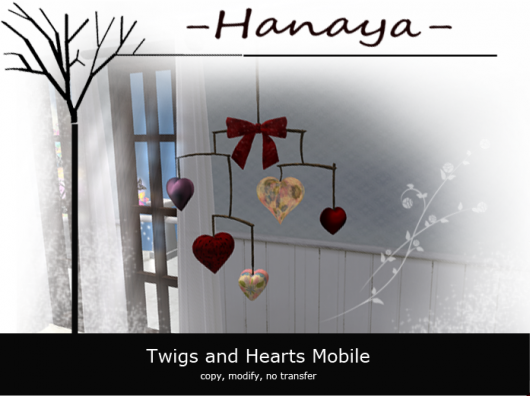 This entry was posted in Freebies and Gifts, News on February 2, 2011 by moriko.